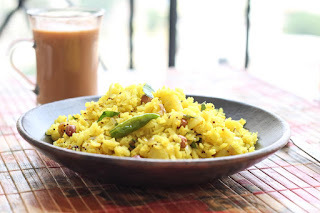 1.Soak the poha in water. Wash and drain all the water. 2.Add some salt , turmeric powder , keep aside. 3.Peel and cut the potatoes into small cubes, chop the onions, chillies, corainder leaves. 4.Heat oil and put chana dal, urad dal, mustard seeds, peanuts, curry leaves and fry until they crackle. 5.Add potatoes , saute for few minutes, then add chopped onions, chillies. 6.Cook till they are done. Add the poha, corainder leaves and stir. 7.Keep it on slow flame for 5- 7 minutes. 8.Let it cool for sometime and add then lemon juice.